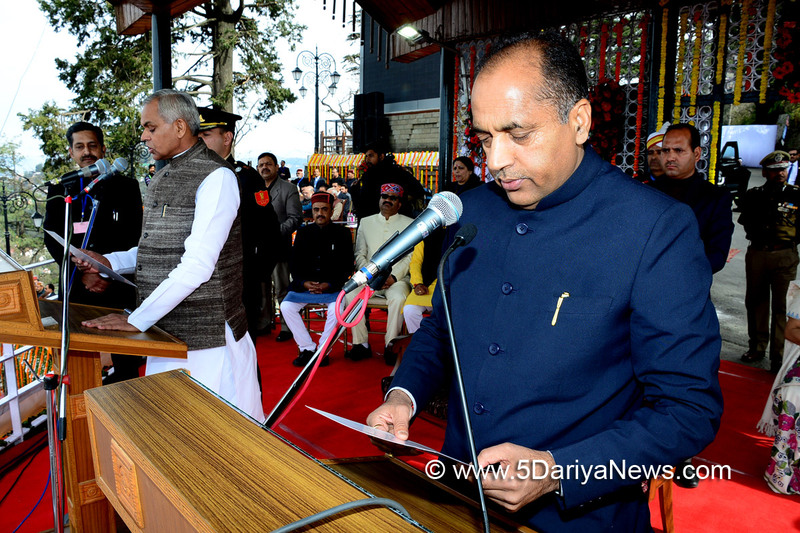 Amidst loud applauds from massive gathering at the historic Ridge Shimla today, Shri Jai Ram Thakur was administered oath of office as the 13th Chief Minister of Himachal Pradesh by the Governor Acharya Devvrat in presence of Prime Minister Shri Narendra Modi, National BJP President Shri Amit Shah, former Deputy Prime Minister Shri L.K. Advani, Union Home Minister Shri Rajnath Singh, Union Road Transport Minister Shri Nitin Gadkari, Union Health Minister Shri J.P. Nadda besides Chief Ministers and Deputy Chief Ministers of various States of the country.Former Chief Ministers Shri Shanta Kumar and Shri Prem Kumar Dhumal were also seated in the first row amongst the other VVIPs including and all MPs and BJP MLAs from Himachal Pradesh. Apart from the Chief Minister himself, 11 other Ministers were also administered oath which includes Shri Mahender Singh Thakur from Dharampur Assembly constituency, Shri Kishan Kapoor from Dharamshala Assembly constituency, Shri Suresh Bhardwaj from Shimla Urban Assembly constituency, Shri Anil Sharma from Mandi Sadar Assembly constituency, Smt. Sarveen Chaudhary the only lady Minister from Shahpur Assembly constituency, Shri Ram Lal Markanda from Lahaul-Spiti Assembly constituency, Shri Vipin Singh Parmar from Sulah Assembly constituency, Shri Virender Kanwar from Kutlehar Assembly constituency, Shri Bikram Singh from Jaswan Pragpur Assembly constituency, Shri Govind Singh Thakur from Manali Assembly constituency and Dr. Rajiv Saizal from Kasauli Assembly constituency.In Shri Jai Ram Thakur's Cabinet, there are six fresh new faces inducted as Ministers. Besides, there are four Ministers from Kangra district, two from Mandi.Shri Suresh Bhardwaj and Govind Singh Thakur took oath in Sanskrit. Born on 6 January, 1965 in Tandi village of Murahag panchayat of Seraj Assembly constituency in Mandi district. His father's name was Shri Jethu Ram and mother's name is Smt. Briku Devi. Thakur did his primary education from Kurani School and studied in High School Bagsyad near Thunag.He completed his graduation from Vallabh Government College Mandi and did his MA from Punjab University. He is the youngest of three brothers. He has two sisters. During his college and University days he was the member of ABVP and in the year 1993 he fought his first election from Chachiot Assembly constituency when he was 26 years of age. In 1998 he won his election from Chachiot Assembly constituency and has been MLA from Chachiot (which after delimitation was known as Seraj Assembly constituency) since then. He is MLA for five consecutive terms. He remained State BJP President and was Cabinet Minister in previous BJP government. He has also remained as Vice Chairman, State Civil Supplies Corporation. He also remained as President of Bharatiya Janta Yuva Morcha.He is married to Dr. Sadhna Singh from Jaipur and has two daughters.